This twelve string monster bass was built to the orders of Rob van der Loo, bass player of Epica. 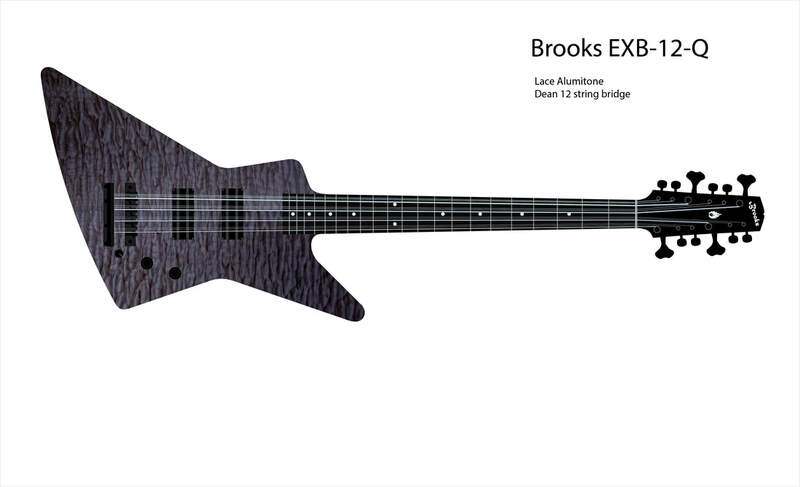 He wanted a twelve string bass, full scale, Explorer body. And two splittable humbuckers, each with its own dedicated output jack. So I started drawing up a design. Finding a twelve string bridge for bass, turned out to be quite a needle in a haystack. Initially I chose to use a Schaller 8-string bridge that I was gonna customize to 12-string. Until I got in touch with Dean guitars, who were kind enough to provide me with a nice genuine 12-string bridge set combination. In black! Another challenge was the headstock with all the hardware that was gong to be attached to it. Twelve tuners is an awful lot of metal! I knew Gotoh makes excellent light weight bass machine heads. So that was an easy choice. But the eight guitar tuners needed to be very light too. I was delighted to find out about the Gotoh Stealth tuners. They are extremely light and they look very sleek and subtle to boot! The neck is a three piece laminate. Reïnforced with a carbon strip in the middle and a pair of two-way spokewheel trussrods. The truss rod access is at the neck joint side, instead of the headstock side. So the headstock is less prone to fractures since there's no excessive wood removal there. Finding the right pickups wasn't very easy too. I figured I needed blade magnets rather than pole pieces, because of the sheer width of each triplet (bass string plus two octave strings). Rob van der Loo wanted humbuckers that could be switched to single coil. And he wanted the neck pickup to be a bass pickup, but the humbucker at the bridge should be a guitar pickup with it's own output for a guitar amp! Most humbuckers proved to be too narrow to pick up all the strings from the outer octave E to the outer bass G string. It turned out Lace Alumitones come in three widths. Meant for exotic multiple string basses and guitars. And they sound killer! Very silent and very tight sounding pickups. How do you connect all that without clogging up the bass with too many knobs and switches? Enter Bas Becu of BQ Music. He is an electronics wizard who develops very clever solutions for guitars , basses, effects and amps. Bas made a nice design for the wiring loom. With a stacked pot for each pickup to set Volume and Tone. Plus a two way switch to choose between humbucking mode and single coil. Last thing I did when the bass was stringed up, tuned and intonated, was finding the right spot for the lower strap button. I placed it off center, roughly at the same height as the E string triplet. I was thrilled to find that the bass balances perfectly. No neck dive!